Brisville A.C., Buczinski S., Chénier S., Francoz D. A cardiac vascular hamartoma in a calf : ultrasonographic and pathologic images // J Vet Cardiol. 2012;14(2):377-80. A right atrial mass was observed by ultrasound in a 3-month-old red Holstein calf. Differential diagnoses included endocarditis or tumor. Due to the poor prognosis, the calf was euthanized. On gross examination, there was a marked dilation of the right atrium. A round, poorly delineated, 2 cm mass was visualized in the right atrium. Microscopic findings were consistent with a vascular hamartoma. A hamartoma is a benign tumor-like nodule composed of an overgrowth of disorganized mature cells and tissues indigenous to the organ involved.1 In veterinary medicine, vascular hamartomas have been reported in various species including cattle. Cardiac vascular hamartomas have been reported in two cows as post-mortem discoveries.2 The present report describes the ante-mortem imaging and post-mortem findings of a cardiac vascular hamartoma in calf. A 3-month-old red Holstein heifer was referred to the Centre Hospitalier Universitaire Veterinaire de l’Universite de Montreal for anorexia and increased temperature for two days. The clinical findings on admission were depression, increased temperature, tachycardia, a grade III/VI rightsided basilar systolic murmur of varying intensity, and pale mucous membranes. Echocardiography from the right side was performed using a 3.2 MHz phased array probe and a 4 MHz sector probec with the calf standing. The right parasternal cranial long axis view of the right ventricular outflow showed an echogenic mass occupying 33%—50% of the right atrial lumen (Fig. 1). The cardiac valves were considered normal. The left ventricular fractional shortening calculated on the right long axis view of the heart was increased at 54% (reference 43.1 ± 2.03). No other anomalies were noted. Figure 1 Right long axis view of the right ventricular outflow in the calf. An echogenic mass (H) was observed attached on right atrial wall (RA). The mass appeared as an organized structure with multiple hypoechoic to anechoic cavities. 4 MHz sectorial probe, 14 cm depth. Ao, aorta; RV, right ventricle; PT, pulmonary trunk; TV, tricuspid valve; PV, pulmonic valve; Ds, dorsal; Vt, ventral. We therefore suspected a cardiac tumoral process of unknown origin, but endocarditis could not be ruled out. Due to the poor long-term prognosis of both suspected diseases, the heifer was humanely euthanized and a complete necropsy was performed. At necropsy, the pericardium showed no abnormality on gross examination. There was a small amount of clear fluid and rare fibrin clots in the pericardial sac. On cut section of the heart, there was a marked dilation of the right atrium which was twice its normal volume (Fig. 2). A round, poorly delineated 2 cm mass was visualized in the right atrium. The epicardium and endocardium close to the mass showed no abnormalities except for mild hypertrophy of mesothelial cells of the epicardium. On cut section, the mass was composed of numerous, randomly organized, thick walled, 1—2 mm diameter blood vessels (Fig. 3). The mass was covered by normal endocardium. No abnormalities were found in other organs. Microscopic examination of the mass revealed disorganized and numerous blood-filled channels of varying size, generally large (1 —2 mm), sometimes anastomosing, lined by plump endothelial cells showing no visible mitoses and no evidence of cellular atypia. These endothelial cells were surrounded by a thick wall (average 400—500 microns) composed of a variable amount of collagen and/or muscular and/or elastic fibers, and sometimes by a loose, myxomatous connective tissue (Figs. 4—6). Between these vascular structures, normal to hypertrophic cardiomyocytes were intermingled with fibrous tissue and adipocytes. Infrequently, these abnormal blood vessels were thrombosed. The microscopic findings were consistent with a vascular hamartoma. Figure 2 Heart, calf. There is a marked dilation of the right atrium, which is twice its normal volume. Note the slight bulge in the wall of the atrium (arrow) due to the presence of a mass. Figure 3 Heart, calf. The right atrium and ventricle are opened, the tricuspid valve is visible. A round, poorly delineated, 2 cm mass is infiltrating the atrial myocardium and protruding in the lumen. On cut section, this mass is composed of numerous, thick walled, 1—2 mm in diameter blood vessels, randomly disposed and supported by an apparently normal myocardium. This is the first report of diagnostic imaging of this condition in veterinary medicine and consequently only very limited data are available on the ultrasonographic aspects of this lesion. Among the 4 casesreported in human literature,4—7echocardiographic examination revealed a circular tumor with smooth borders.6 The tumoral tissue was hyperechoic, homogeneous, devoid of cysts, and there was no evidence of myocardial infiltration.6 In our case, multiple "cystic structures” were observed inside the mass. Similar cystic images have been reported in canine hemangiomas localized to organs other than the heart.9,10 This cystic appearance probably results from the blind-ended abnormal blood vessel inside the mass. Note the disorganized and anastomosing vascular channels separated from each other by normal myocardium (M), adipocytes (A) and loose connective tissue. Their wall is generally thick and made of collagen and/or muscular and/or elastic fibers. Hematoxylin-eosin (HE), 25X. The mass was the main feature of the echocar- diographic examination. Even if cardiac neoplasms are rare in cattle (especially compared with endocarditis), tumoral processes can be suspected in the face of a cardiac mass with the ultrasonographic appearance reported in this case. The main differential diagnoses of a right atrial mass in this species include bacterial endocarditis or neoplasm. Endocarditis is generally located in the valves in cattle (most commonly the tricuspid valve) but can also affect the mural endocardium.11,12 Depending on the size of the lesion, mural endocarditis could also partially obstruct the affected cardiac cavity.12 The typical ultrasonographic findings in bovine bacterial endocarditis are a thickened cardiac valve with a shaggy and heterogeneous appearance11 sometimes compared with cauliflower. Figure 4 Vascular hamartoma, right atrium. These subgross pictures of the mass reveals multiple, anastomosing, thick walled vascular channels of variable size that invades the atrial myocardium. 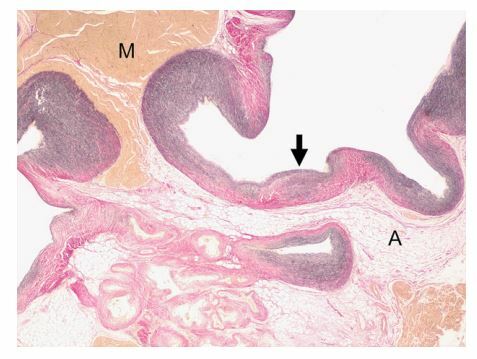 Hematoxylin-eosin (HE) (a), Masson’s trichrome stain (b). Note that their amount vary between vessels and within individual ones (arrow). Car- diomyocytes stain in yellow and collagen in pink. Myocardium (M), adipocytes (A). Miller’s stain, 25X. Among cardiac neoplasms, lymphoma is the most frequent.13 Usual echocardiographic characteristics of this tumor include anechoic pericardial effusion (sometimes a large volume), a dilated right atrium, and a thickened atrial wall.11 These features were different from our case. Vascular hamartomas have already been reported in cattle in others organs2,14-18 in addition to the heart.2 Interestingly, in the present case the tumor was located in the right atrium, similar to the only two other cases reported in cattle.2 This finding supports the hypothesis that the right atrium might be the predilection site in the heart for such tumors. 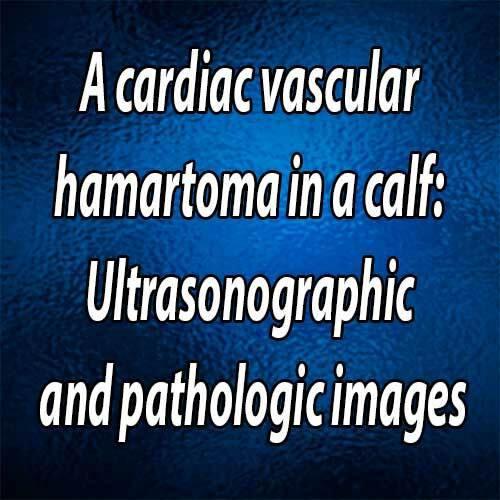 In humans, 3/4 cardiac vascular hamartomas described in the literature were located in the ventricles, usually the left one.6,7 In conclusion, this case describes the ultrasonographic and pathological features of a cardiac hamartoma in a calf. 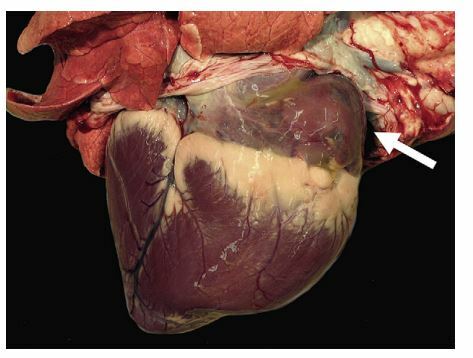 A benign primary cardiac tumor should be included in the differential diagnoses of an intracardiac mass in cattle. Conflict of interest - None. MaxieMG, Robinson WF. Cardiovascular system. In: MaxieG, editor. Pathology of domestic animals. 5th ed. Philadelphia: Saunders Elsevier; 2007. p. 1-106. Sugiyama A, Ozaki K, Takeuchi T, Narama I. Cardiac vascular hamartoma in two slaughtered cattle. J Comp Pathol 2007; 136:202-205. Amory H, Jakovljevic S, Lekeux P. Quantitative M-mode and two-dimensional echocardiography in calves. Vet Rec 1991; 128:25-31. Franciosi RA, Gay RM, Ah-Tye P. Vascular hamartoma of the heart in a child. Am Heart J 1970;79:676-682. May IA, Hardy KL, Char F, McAdams J. Vascular hamartoma of the right atrium with successful resection. Ann Thorac Surg 1965;10:64-71. Miche E, Kloppe A, Minami K, Montanus H, Ohlmeier H, Koerfer R, Notohamiprodjo G, et al. Vascular hamartoma of the left ventricle. J Cardiovasc Surg 1998;39: 479-482. Rouxel P, Courgeon P, Guillou M, Pony JC, Logeais Y, Gouffault J. [Benign vascular tumor of the heart. Apropos of a case of vascular hamartoma of the left ventricle successfully operated on]. Arch Mal Coeur Vaiss 1974;67: 1231-1240. McGavin MD, Zachary ZJ. Pathologic basis of veterinary disease. 4th ed. St Louis: Mosby Elsevier; 2007. 255-256. Aita N, Iso H, Uchida K. Hemangioma of the ileum in a dog. J Vet Med Sci 2010;72:1071-1073. Kamonrat P. Ultrasound diagnosis a renal solid mass (hemangioma). Thai J Vet Med 2009;39:353-355. Buczinski S. Cardiovascular ultrasonography in cattle. Vet Clin North Am Food Anim Pract 2009;25:611-632. HealyAM. Endocarditis in cattle. Irish Vet J 1996;49:43-48. Burton AJ, Nydam DV, Long ED, Divers TJ. Signalment and clinical complaints initiating hospital admission, methods of diagnosis, and pathological findings associated with bovine lymphosarcoma (112 cases). J Vet Intern Med 2010;24: 960-964. Benoit JM, Lefebvre RC, Mulon PY, Raggio I, Dore M. Ovarian vascular hamartoma in a cow. Can Vet J 2005;46: 1026-1028. Ladds PW. Vascular hamartomas of the liver of cattle. Vet Pathol 1983;20:764-767. Osborne JC, Troutt HF. A congenital pulmonary anomaly (hamartoma) in a seven-month-old bovine fetus. Cornell Vet 1977;67:222-228. Tyler JW, Hassel DM, Long MT, Henry CJ, Parish SM. Testicular vascular hamartoma in a calf. Vet Rec 1995;136: 420. Yeruham I, Abramovitch I, Perl S. Gingival vascular hamartoma in two calves. Aust Vet J 2004;82:152-153.